Oil on canvas, 41 x 35 cm. Both as a person and as a subject, Leonora Christina become a pivotal turning point in Zahrtmann’s life and artistic career. 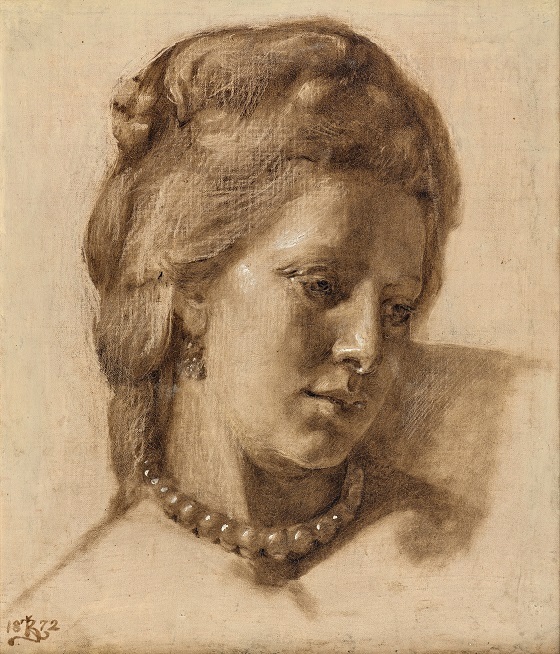 In addition to harbouring a fascination with her mercurial fate, this choice of subject also gave Kristian Zahrtmann a unique opportunity to depict the psychological dramas playing out in the royal court at the time. This study of Queen Caroline Mathilda is an intimate portrait of the queen and was part of the background work that went into the painting of Zahrtmann’s major work Scene from Christian VII’s court. In the completed painting, a concentrated Queen is featured playing a game of chess with the Royal Physician, Johann Friedrich Struense, while King Christian VII himself is passing the time by teasing a parrot with his rapier. In this preliminary study, however, there is a certain melancholy about the queen which is easily overlooked in the final painting. The monochrome colour scheme distinguishes the study from Zahrtmann’s characteristically vibrant palette. Zahrtmann became one of the most important art teachers of his era at the Artists’ Study School at the Academy of Fine Arts, popularly known as Zahrtmann’s School. His history painting and his insistence on classical training contributed to his great popularity. He was moreover one of the founders of The Free Exhibition. Today Zahrtmann is perhaps best known for his famous series of paintings depicting Princess Leonora Christina (1621-1698). Zahrtmann had a lifelong fascination with this heroic princess, and painted his first depictions of her under the influence of the Golden Age painters. These works further contributed to history painting experiencing a renaissance in Danish art. Later, Zahrtmann was among the generation of artists who aligned themselves with the modern breakthrough and naturalism. In the last years of his life, between 1890-1911, Zahrtmann’s love of Italy led to him taking a number of trips to Civita d’Antino, where he produced a series of paintings in vibrant, glowing and sensual colours.